Portable gas detector great for leak detection, personnel safety, and general gas detection. Capable of sensing multiple gasses (see list below) with simple sensor swaps. Integrated datalogging, and audible alarms. 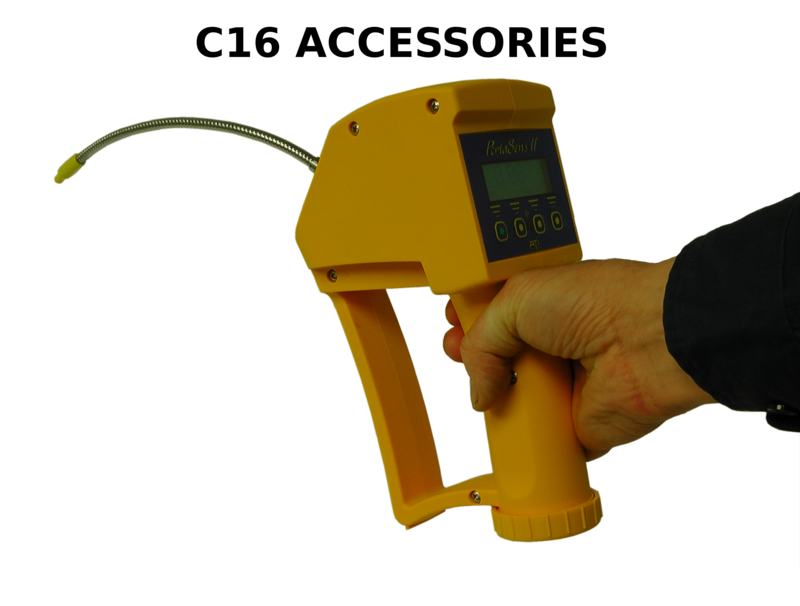 The C16 is sold with every accessory you may need for accurate and fast portable gas detection. The C16 is a great device for gas leak detection, personal safety, spot checks, confined entry, or even datalogging of gas levels in a workplace. The C16 is a great portable monitor, but can also serve as fixed monitor placed in a location where it logs data over long periods of time. The C16 is a mulit-gas sensor that will allow for a variety of gasses to be measured with the same device. Choose the gas sensor you require, or choose additional sensors here, to add to your order. Each gas sensor is listed with a standard range however each sensor can be calibrated to custom ranges. Contact us for details on gas sensors you do not see here, or gas ranges you may require. 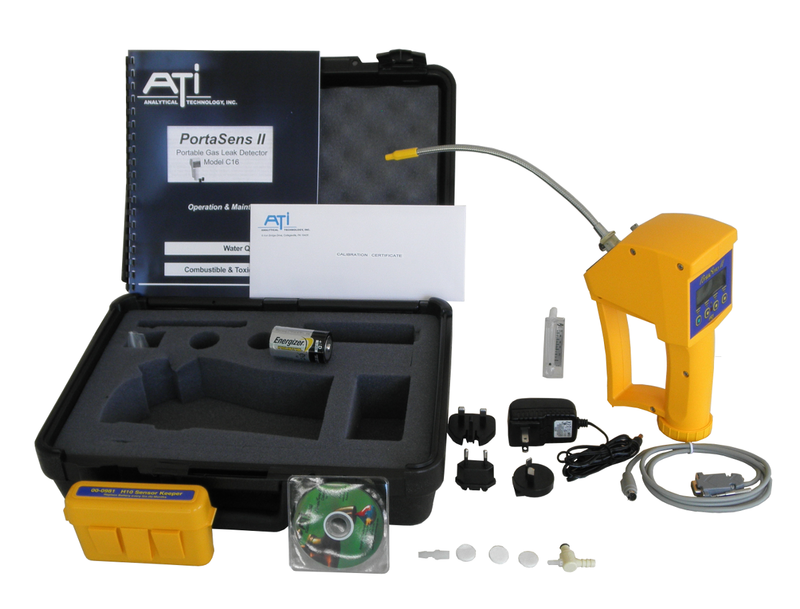 The Series C16 PortaSens II portable gas leak detector is a versatile tool for performing regular leak checks in gas storage areas, around process equipment and piping or in confined spaces prior to entry. Designed for easy one-hand operation, the detector contains an internal sample pump and a flexible sampling wand to allow pinpoint location of the source of leakage. A large character display insures that measured values are easily visible, and a back-light for the display insures readability in low or no light conditions. A unique feature of the C16 detector is its ability to measure a variety of different gases by simply inserting the appropriate sensor for that gas. This means that one detector can be used to measure over 30 different gases or vapors, reducing the need to purchase individual detectors for each type of gas. And sensors can be changed quickly and easily, without the need for calibration when a sensor change is made. Sensors used in the PortaSens II are ATI’s newest miniaturized smart sensor modules. Each sensor module is actually a sensor, amplifier, and memory module in one compact package. Because of this design, sensor modules can be calibrated independently and simply plugged into any detector for immediate use. When installed in a detector, calibration data is loaded into the microprocessor so that no adjustments are needed. The result is that a detector can, for example, go from phosgene measurement to ammonia measurement in less than one minute. which means up to 8 extra sensors ready for immediate use. Click HERE to add additional gas sensors to your order. 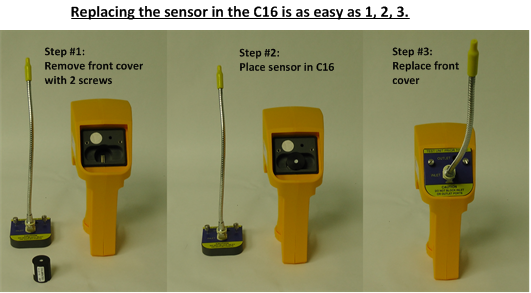 Sensors in the C16 can be changed easily. See image below. Remove 2 thumbscrews from the sensor cover, remove the sensor cover, and swap sensors. If you are using the sensor keeper (included with the C16) spare sensors can be kept warm and ready to use. Spare sensor keeper allows for use of a battery to keep power to the sensors. Therefore, after swapping sensors there is virtually no delay in measuring your new gas! The C16 is capable of onboard data logging of your gas measurements. All data logging cables and software are included with the C16. Datalogging is easy to set-up and easy to use. 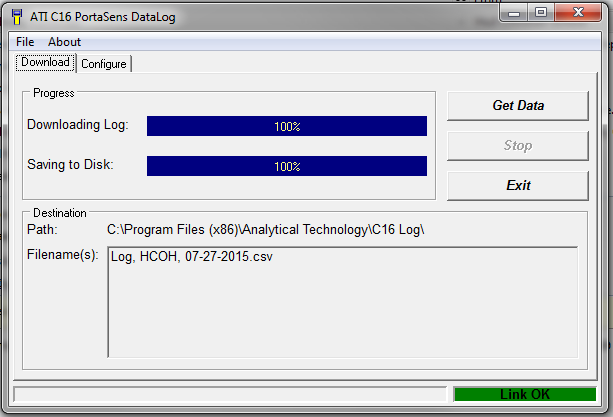 The screenshot below shows the datalogging set-up of the C16. 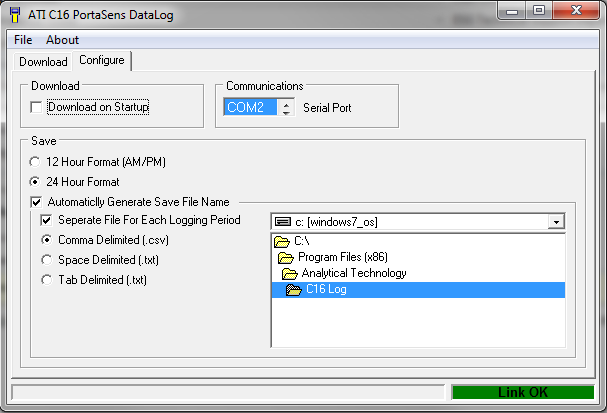 A very simple interface is used to set-up your data logging software and download. Data is logged with C16 and downloaded. All data is exported to a CSV file that can be graphed or shown as a table with common spreadsheet software on your computer. View a list of the C16 accessories.